Hardcover, 6.25 x 9.25 in. / 136 pgs / 50 color / 10 bw. The Fundación Cisneros’ new Conversaciones series is dedicated to the exchange of ideas between artists and authors. 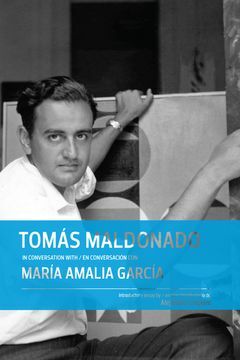 This second publication in the series contains a collection of interviews between the Argentine-born artist, industrial designer and theorist Tomás Maldonado and writer María Amalia García. Maldonado established his reputation while a professor at the Hochschule für Gestaltung in Ulm, Germany. Under his leadership, the school functioned as an extraordinary laboratory of design and a center of talent until 1968. More than 20 years after its closing, Ulm is still considered one of the most important European schools of design since the Bauhaus. María Amalia García is an accomplished art historian, who has written extensively on abstract art in Argentina and Brazil. FORMAT: Hbk, 6.25 x 9.25 in. / 136 pgs / 50 color / 10 b&w.